An obsessed Miley Cyrus superfan is getting his tattoos of the twerking pop star removed as he says they’re ruining his love life. 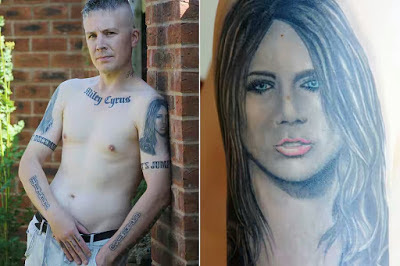 Carl McCoid, 43, from Bridlington, East Yorks, has a whopping 29 Miley-inspired inkings but now he claims he doesn't like the singer anymore and is begging tattoo artists to cover them up so that he has a chance of finding a girlfriend. » D’banj, Miley Cyrus & Mariah Carey to Perform at 2014 World Music Awards.